Randomization can be integrated into the assessment process from the beginning of test creation. After compiling one or more question banks of "known, good questions", you can create a test by importing items from as many banks as desired into the new test template, with the option of modifying some or all of the test properties, such as activation date ranges or retake options. To optimize randomization, it is recommended that each question used is assigned a point value when creating or editing at the question bank level without changing the sum, or Total Test_points. Randomizing from questions with different point values would result in an inconsistency in test-taker scores. The settings used by the test maker will determine how the randomization will be applied to the selection. These settings can define the number, order and grouping of questions presented in the computer based test. The set of questions may have been created manually, cut and pasted from a text editor, imported from one or more question banks or by using TG's Test Wizard. 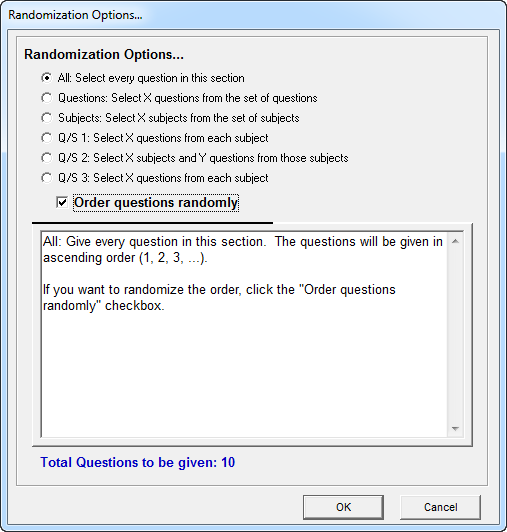 The user may choose to randomize every question in the section by selecting All or select "X" questions to randomize from a set of questions or subjects. The Test Question Bank refers only to the set of "X" questions making up the specific test. Randomizing a subset of test questions from a set of X total test questions can be performed, such as 20 items out of 50. The questions will be randomized in ascending order or can be truly randomized by clicking the "Order questions randomly" checkbox. Unless all questions are scored the same, the total score for the section may vary with each attempt. Users may randomly select a specified number of subjects or choose from three question per subject options. "Q/S 1" selects X questions from each subject to randomly select the same number of questions from each subject in a test. "Q/S 2" selects X subjects from various question banks and Y questions from those subjects, or in other words a random selection of a specified number of subjects, with a specified number from each subject. "Q/S 3" randomly selects a subset of questions from each subject set. Test authors may also choose to randomize answers for multiple choices, check boxes, ordering or like question types by clicking the "Show Answers Randomly" option under "Question Settings." Test Generator's Test Wizard allows users to create a test, randomly select X question banks and then X questions from each bank. A test maker app's randomization capabilities help discourage cheating and extend the shelf-life of their tests by delivering different content to each user.